Foster Kennedy syndrome is the neurological condition in which unilateral or ipsilateral optic atrophy occurs as a result of direct pressure on optic nerve. It is also characterised as contralateral papilloedema which occurs due to increased intra cranial pressure, central scotoma and anosmia. There may be various causes behind Foster Kennedy syndrome. Most common cause is tumor in frontal lobe. Patient may lose his vision. Foster Kennedy syndrome resembles pseudo Foster Kennedy syndrome but both are different. Foster Kennedy syndrome is also known as Kennedy's syndrome and true Foster Kennedy syndrome. As meningiomas is the cause of Foster Kennedy syndrome, so there are various risk factors which may further complicate meningiomas. These risk factors are neurofibromatosis type 2, excessive exposure to radiations previously, females are more prone to Foster Kennedy syndrome. When we talk about its diagnosis, the symptoms helps a lot. An enlarged blind spot is observed in the neighbouring eye. Common symptom i.e. 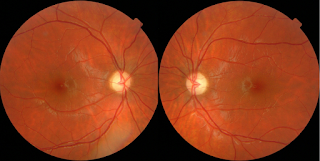 progressive visual loss shows Foster Kennedy syndrome. Symptoms like headache, vomiting, nausea and diplopia confirms it's presence. Changes in personality is another visible symptom showing Foster Kennedy syndrome. Some neurological imaging is performed for confirmation. CT scan or MRI of head and orbital region is performed. Foster Kennedy syndrome have various characteristics but it's symptoms are limited. All the symptoms of Foster Kennedy syndrome resemble with symptoms of pseudo Foster Kennedy syndrome. Reported symptoms are headache, vomiting, nausea, diplopia, visual liability, anosmia and most commonly progressive visual loss. Vision of the ipsilateral eye varies due to optic atrophy. But vision of contralateral eye is spared. RAPD which is abbreviated as relative afferent pupillary defect is present in the affected eye. Vision loss is not sudden, but patient loses his vision slowly, day by day. Proptosis may occur due to orbital involvement. It is initiated from arachnoid cells which has different histological appearance. It started from epidermal to mesenchymal cells. These cells are distributed in a way that it appears like polygonal epithelial spindle or fusiform shape. Compression of ipsilateral optic nerve by intra cranial mass causes Foster Kennedy syndrome. When the intra cranial mass become bigger in size, it tends to increase intra cranial pressure. This increased pressure leads to contralateral papilloedema. The optic nerve is no more able to show optic disk edema, that's why only contralateral papilloedema is seen. Cranial meningiomas also causes Foster Kennedy syndrome. As meningiomas are the main cause of Foster Kennedy syndrome, so surgery is performed primarily to treat it. If tumor is responsible for Foster Kennedy syndrome. Then corticosteroids are prescribed which will work by reducing intra cranial pressure and tumoral edema. Radiotherapy is used to treat benign meningiomas. Chemotherapy and Hormonal manipulation are not preferred. Hydroxyurea is recommended in patients having large residual tumors. Surgery is considered the best treatment option. Gross total resection is performed to embolize the vascular tumor And it will lead to decreased intra cranial pressure. Surgery has less complications with good output.